I’m sure many of you will hear that image and you’ll even know what Mach’s cone is. 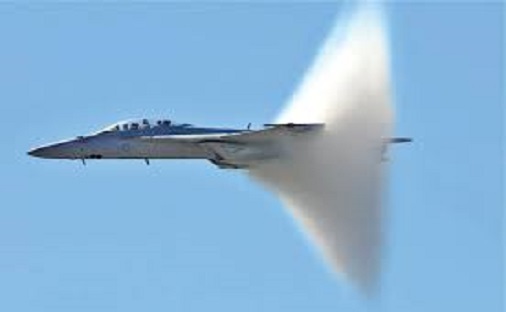 You will know that it is formed when an airplane passes the speed of sound although you will not understand that the Mach cone, really, is and is called an envelope to an object that travels at speeds superior to those of sound. 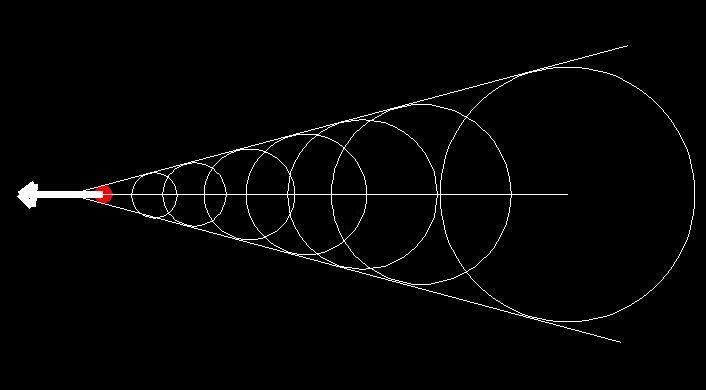 That is to say, Mach’s cone, mathematically, is simply to solve and find the envelope to an object that moves at a certain speed. Let’s go to the mathematical “nougat” (this expresion means that we go deep into the math needed for resolving it). Suppose that sound travels at a speed c and that an object (an airplane, to be exact) travels at a speed v greater than c (v>c) in one direction. Let’s take that direction (since we presuppose that it does not vary) as one of the axes (to simplify the calculations), for example, the x-axis although it can be any of the other axes or even a definite line. But, I repeat, moving the axes will make the plane move on the x axis. Since we are, suppose that, as it travels at speed v, at a certain moment the plane will be in the next position (vt, 0, 0). Let’s move at a constant speed and, easily, we can know its position. The airplane will generate sound (obviously) that expands spherically, like any wave. Here there is little to scratch. We have taken everything aside and created a function. Simple. That, graphically (and taken from Wikipedia because drawing is not mine work). Because physics and mathematics are very beautiful.